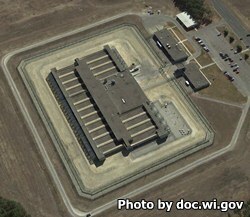 Wisconsin Secure Program Facility is a maximum security prison located in Boscobel Wisconsin. This facility specializes in housing inmates who are difficult to manage and have displayed severe behavioral issues while housed at other institutions. While offering a more secure environment, Wisconsin Secure Program Facility provides the essential programming needed to modify an inmate's behavior to an acceptable level where they can then be returned to a general population. This facility has two housing units that house 211 general population inmates, and program segregation/disciplinary separation units. The maximum number of offenders that can be housed at Wisconsin Secure Program Facility are 500 adult males. Wisconsin Secure Program Facility places a strong emphasis on privilege. The facility utilizes a three phase system where inmates are rewarded for good behavior and awarded privileges that include phone calls, earned wages, tv time, canteen items, leisure time, group education/treatment, day room time, group recreation and property allowance. After the inmate's exhibit good behavior for a period of time they may be returned to a less restrictive maximum security prison. In order to go through the three phases, inmates are required to participate in programs like anger management, rational emotive therapy, free your minds, life skills, cognitive group intervention program, and turning point. Sundays, Mondays, Fridays, Saturdays, and Holidays from 8:30am-11:30am and 12:30pm-3:30pm. ​For more information read the Wisconsin Secure Program Facility Visitors Guide here.